Zip and UnZip Files ... Easy and Free! Easy Zip and UnZip file utility software to open, create, modify & extract ZIP files. UnZip any ZIP files quickly and easily. List files in a ZIP file, extract all or selected files. View files in ZIP archives before extracting. 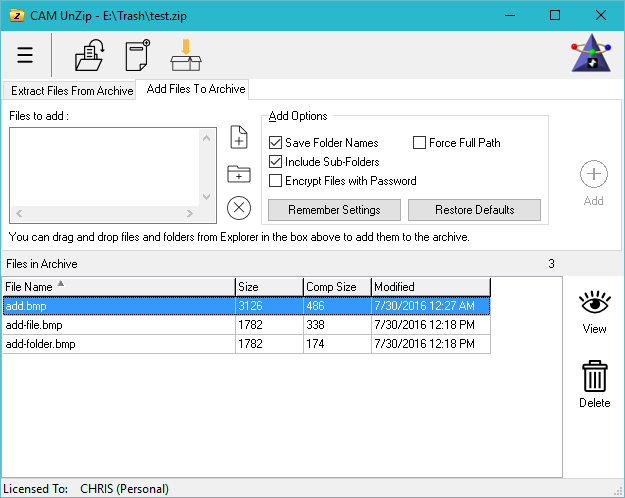 Create new ZIP files and easily add/remove files. Optionally run setup after unzipping. Run downloaded ZIP file installers automatically. Command line interface exposes all features and options so you can call it from batch files and other programs with complete control of the Zipping/Unzipping process. NEW! Portable install option to run from a USB Drive, DropBox, Google Drive, etc. without any changes to your system. NEW! Windows 10, 8, 7, Vista, 2000, XP Support. NEW! Encrypted password protected ZIP file support. NEW! Command line support for using with the Send To menu. Click on the download icon above to download CAM UnZip. You may use CAM UnZip for your own personal use free of charge. If you find CAM UnZip useful please make a Donation. Government, Business and Educational entities please read about Commercial Licensing. "I can't believe how easy CAM UnZip is to use. I just started using computers and quickly discovered the importance of ZIP files. Everything is so complicated, but not CAM UnZip"
"With CAM UnZip I get a simple fast way to handle ZIP files." "I really enjoy using your product. A nice, simple, uncluttered interface, but still has all the features I need." - Kate W., Brighouse, England U.K.